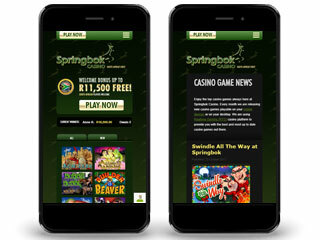 Springbok Casino is a South African gambling venue, where you can put your hands on a large variety of games, bonus codes, promos, and exciting features! This April Springbok Casino Honours South African Record Holders! 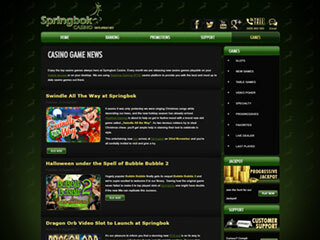 Check out Springbok Casino as they pay tribute this month to our South Africa record holders! Enjoy the fun and fascinating stories. Then….enjoy 25 Free Spins on the Springbok slot: Ghost Ship!!!. Don’t miss out – get in on the Springbok free spins action!! It is common knowledge that there are dozens, if not hundreds, of online gambling venues that players from all around the world can access. Although most gambling venues accept players from the US, if you reside in other countries you might not be so lucky. Some countries have strict laws regarding online gambling, which means that citizens don’t have access to some of the major casinos. However, the dedicated players have nothing to worry about since there are plenty of local gambling venues to keep them entertained, and they aren’t half bad. This is a review of one of those regional casinos, and it can shed some light on the best South African casinos can offer. The Springbok Casino review will provide you with all the necessary info regarding one of the leading gambling venues in South Africa, so stay tuned and find out as much as you can! The first thing you notice about the casino is its connection to the African culture – apart from naming the casino after the national animal of South Africa, the casino also dedicates an entire section to what the country is all about. From posts about the wildlife in Africa to lists of the most popular heroes, this gambling venue won’t let you forget about local traditions – which gives off an authentic vibe you can’t ignore. The casinos’ layout was perfectly planned out, and you won’t have any trouble in finding your way around the casino. So that you can seriously contemplate giving this gambling venue a go, here are a few important things you should know. We hope they’ll help you make up your mind to try out Springbok. The first thing you notice about any gambling venue is the selection of casino games it can grant you access to – and Springbok Casino doesn’t disappoint in this department. This casino uses the RTG gambling platform to provide you with an unforgettable assortment of games. Although the casino is a bit lacking in the selection of progressive jackpot games that are available to you, it certainly makes up for it by showering you with dozens of different slot games, table games, video poker, and even some surprising specialty games. You can access those games via the online casino platform, the downloaded software, or the mobile app – which means you can gamble to your heart’s desire at any time of the day, no matter if you have a busy schedule or not. Checking out the promotions section of the casino is also crucial if you want to increase your wins with minimal effort on your part. First and foremost, the Springbok Online Casino awards all new players with a generous welcoming package that goes up to R11,500. This bonus will be awarded to you in the form of three matching bonus codes you will be able to use once you create a paying account. After you establish yourself as a permanent player at the casino, you will be able to use the rest of the promos and bonus codes to your advantage. You have the 25% cashback bonus, the 300% matching bonus you get for every deposit you make, and the monthly matching bonuses you might get if you are lucky enough. Springbok Casino uses advanced technology methods to ensure the safety of your personal details. The fact that this casino has received the title of “the best casino of 2016”, is a testament to how trustworthy this gambling venue is. If you run into any problems during your gambling session, you can contact the casino’s support team via phone, email, or a live chat you can use 24/7. Springbok Casino is a prestigious South African gambling venue, where you can find all kinds of exciting elements that can turn your gambling session into a wild adventure. So if you are ready to have some fun, this is the gambling venue for you!